License administrators monitor the OpenLM EasyAdmin web interface, and manually return a license back to the license pool. OpenLM automatically detects idle FlexLM licenses, removes them and suspends the application’s process. This method is referred to as “Suspend and Resume”. OpenLM automatically saves and closes idle MATLAB , Autodesk and ArcGIS sessions. It does so with the use of dedicated extensions, specifically implemented by OpenLM for each of these applications. This method is referred to as “Save and Close”. OpenLM 3.1 has added a new method for further enhancing idle license identification and retrieval. This is referred to as retrieval through “Agent procedures”. This method is described in this document. 1. General purpose license retrieval, of licenses managed by any type of license server (not just for FlexLM). OpenLM 3.1 has provided a script-based, flexible, configurable mechanism to facilitate such requests and accommodate future scenarios. 1. If not previously done, Install the OpenLM Agent onto the workstation from OpenLM Download. This can be done either manually, or deployed quietly via msiexec or GPO. 2. Towards the end of the installation process, the Agent Configuration dialog window opens. Type in the OpenLM server with which the Agent is required to connect, and click Apply. A similar option is available through the deployment flags when installing the Agent silently. 3a. Click the EasyAdmin Start → Administration → Process/Features. The Process/Features window opens. Find the required process and copy its exact (case-sensitive) name. Click ‘Add’ in the Process List frame, on the top right – hand side of the “Process features” window. The “Add process” window appears. Type in the exact process name, the vendor name as appears in the license file, and a free text description of the process. For processes that already exist in the process list, select them and click ‘Edit’. 4a. Highlight a current process, and click ‘Add’ on the lower-righthand corner of the “Process features” window. A dialog box appears. Select the required Feature name from there. 4b. Click “Add all vendor’s features”. This will include all the vendor’s recorded Features in the list of monitored features. 5. If an Agent procedure does not yet exist, click EasyAdmin Start → Administration → “Agent Procedures”. The “Agent Procedures” window opens. Click ‘Add’ and add a new procedure (e.g. : ug_procedure1). 6. In the “Edit process” window (or the identical “Add process” window for new processes) check the ‘Enabled’ and the “Enable License release functionality” checkboxes. 7. Click the drop-down menu at the License release method. Select ‘Procedure’, and fill in the procedure name. 8. Set the “Enable License release functionality” parameters. These parameters determine the policy for license retrieval, once they have been labeled Idle. 9. Expand the ‘Advanced’ panel, and set the system resource threshold parameters. These numbers are thresholds used for determining whether the monitored application is idle. The default values shown should not be changed unless explicitly instructed by OpenLM’s support team. Changing these values inappropriately can harm the OpenLM system’s performance. OpenLM is now configured to monitor and detect idle processes and features. Now the actual procedure that dictates the license retrieval policy needs to be set. Agent procedures may comprise of multiple steps, and may invoke external scripts. The order and relation of procedure steps as well as the content of each step affects the procedure flow. 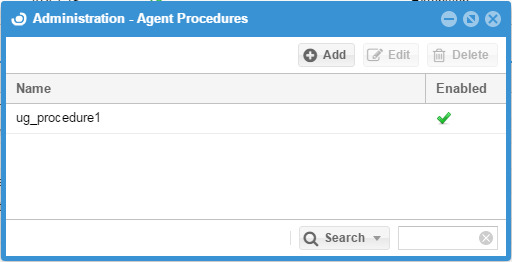 In order to configure a procedure, select one from the “Agent procedures” window, and click the ‘Edit’ button.The “Edit procedure” window opens. On The “Edit procedure” window each row represents a procedure step. Steps can be added by clicking the “Add actions” button. Each step needs to be separately configured by setting up the content of 3 columns: “Action type”, “Script info” and “Execute condition”. Help information is available by clicking the information ‘?’ icon on each column header. Each step can be set as active or inactive, according to the ‘Active’ check box. License Manager – Access relevant License Manager to release/kill the feature. Agent Kill – Instruct the OpenLM Agent to kill a specific process. Agent Suspend – Instruct the OpenLM Agent to suspend a specific process. Agent Script – Instruct the OpenLM Agent to execute a script or command on the OpenLM Agent machine. This column contains command lines or paths to batch files which will be run by the Windows shell on the OpenLM Agent machine. This enables administrators to perform conditional sequences of any Windows shell command (e.g. invoke or kill applications) as part of the Agent procedure. Click the info ‘?’ icon for more information. This column reflects the procedure’s flow control. No Wait – step can be invoked regardless of previous step. This is the default value for the first step. Wait Success – Wait for the previous step to complete successfully. If one step requires Wait Success and previous step completed with error, the procedure is terminated. No further steps are executed. That’s it. OpenLM can now perform any sequence of conditional actions following the detection of idle applications. Please feel free to contact the OpenLM Support team (Support@OpenLM.com) in case you require further assistance in implementing your Agent procedures.